Science will be celebrated this weekend as more than 1,000 middle and high school students (grades 7-12) from around Southeast Texas share their knowledge and discovery at the 60th Annual Science and Engineering Fair of Houston, presented by the University of Houston STEM Center and Chevron. The event is from 8:30 a.m. - 6:30 p.m., Saturday, Feb. 23 at the George R. Brown Convention Center. 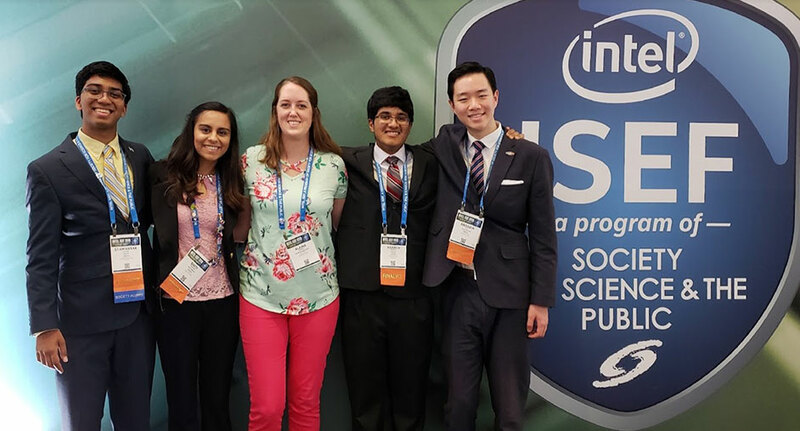 Smiti Gandhi (2nd from left) at the 2018 Intel International Science and Engineering Fair. The students’ projects are based on 17 science fair categories that include animal science, plant science, environmental science and engineering. Winners will qualify for the Texas State Engineering Science Fair next month at Texas A&M University. Grand award winners are eligible for the INTEL International Science and Engineering Fair in Phoenix in May. Last year, six winners went on to compete internationally. A group of students from Houston’s Third and Fifth Wards who have participated in STEM Zone Saturday, an educational outreach collaboration between the University of Houston STEM Center and Kids Lives Matter, a nonprofit organization that enriches the lives of children in underserved areas, will serve as youth Special Awarding Agency judges. “Providing underserved students leadership opportunities in STEM fosters their desire to become career-minded and obtain skillsets to meet future industry needs,” said Heather Domjan, SEFH executive director and interim executive director of the UH STEM Center. The students from Kids Lives Matter will learn how science fair participant projects are useful to the real world, how they represent out-of-the-box thinking and whether the scientific concept can be explained to multiple audiences. Smiti Gandhi, a UH Honors College student and biomedical sciences major in the College of Natural Sciences and Mathematics, will be working with the student judges. Last year, as a senior at Clear Brook High School, Gandhi and former classmate Andrew Liu won the 2018 SEFH Grand Award for Physical Science and placed third at the Intel International Science and Engineering Fair in Pittsburgh. She credits her success to her mentor, high school AP biology teacher Alaina Garza. SEFH is one of the largest events of its kind in the country. Other sponsors include Total, McDermott, Shell and Phillips 66. WHEN: 8 a.m. - 6:30 p.m., Saturday, Feb. 23; judging will run from 9 a.m.-4:00 p.m. Public Day for the community to visit the projects runs from 4:30 – 6:30 p.m.